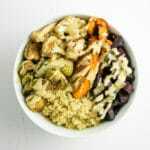 This Roasted Veggie Buddha Bowl recipe is made with savory, seasonal vegetables, fluffy quinoa, and a healthy drizzle of tahini. It’s a filling and wholesome vegan meal for lunch, dinner or meal prep! 1 Tablespoon rosemary, fresh is best but dried works! herbs – parsley, cilantro, basil, etc. Preheat oven to 375º and line a large sheet pan with parchment. You may need two pans if yours are on the smaller side. Prepare vegetables as instructed above, then arrange on the sheet pan. Be sure to spread them out and try not to layer them. This will prevent them from “steaming” or turning out soggy. Place the pan into the oven and roast for 20 minutes, then give the veggies a good toss and return to the oven. Cook 15 minutes more and then remove. Enjoy immediately, or allow to cool and store in the refrigerator. Cook quinoa and set aside to cool. Portion quinoa evenly between 4 bowls or meal prep containers – about 1/2 cup in each. Pile on the veggies – add as much or as little as you like. Drizzle with tahini or sauce of your choosing, then add toppings if desired! If you’re prepping these ahead, leave the sauce off until you are ready to eat. They can be stored in the fridge for up to a week!